Great experience awaits you at the 2013 Holy Ghost Congress. The RCCG Holy Ghost Congress starts on Monday 9th, December and runs till Saturday 14, December. There are morning , afternoon and evening sessions. The morning sessions start on Wed 11th, December from 9am daily, the afternoon sessions begin on Tuesday Dec. 10, from 4pm daily and the evening sessions begin on Monday from 7pm daily. Pastor E.A. Adeboye is ministering every evening. A wide range of men of God from Nigeria and abroad are ministering. Pastor E.A. Adeboye along RCCG mass choir, Vinesong and other guest gospel musicians will be on hand to minister. The facilities have been upgraded. There is increase in water supply Capacity, regular power supply is assured. The parking lots have been expanded. There is no need for anyone to park his vehicle by the express. The General Overseer wants to make it clear people coming for this programme must not park at the express and disturb the free flow of the traffic. There is enough parking space within the Camp and near enough to Arena. Team Nehemiah controls the traffic and parking within the Camp, and they are doing a marvellous Job so we enjoin everyone to cooperate with them. There is adequate manpower to handle security of lives and property. 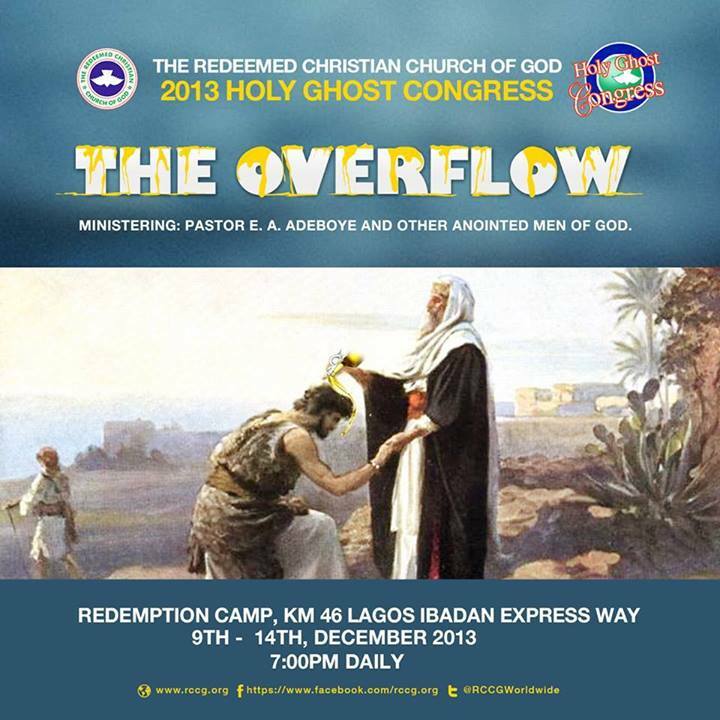 The Theme of this Year’s Holy Ghost Congress is “ The Overflow”. Come and have a great experience of the word, fresh oil, praise, miracles and overflow of anointing. Good day Dady G.O. my name is peter from igarra.Akoko Edo L.G.A. Edo State.Dady since 2011,in my final year exam. I receive an attack,of high blood pressure.eva since then,I had be believing God for healing. sir,a word from God about my condition.will make me hole again.thank you Dady. God bless you sir. Peter saiki jimoh. It was a wounderful experience in the presence of God, I return unto him all the glory.